Taking care of a child with cerebral palsy can be emotionally and mentally draining without the added financial burden of providing the medical care and therapy that is required. It is for this reason the Springfield cerebral palsy attorneys of Rosenfeld Injury Lawyers LLC are committed to pursuing fair compensation on behalf of anyone whose child has been injured at birth due to medical negligence. We believe that nobody should be forced to endure this kind of hardship alone and are happy to help families find the support and resources they need to be able to provide for their special needs children and to ensure that they are able to thrive well into adulthood. We often see recoveries in excess of $5 million for families whose children were permanently injured at birth due to the exorbitant cost of providing medical care for someone over the entire course of his or her lifetime. Regular doctor visits, physical therapy, surgeries and other special medical treatments may all be part of the treatment plan for a child with cerebral palsy and this care can become so expensive that it cripples the family’s finances. To make matters worse, the needs of the child may require that one of the parents leave the workforce, further burdening the family by reducing its overall income. If your child’s injuries were due to medical malpractice, there is no reason whatsoever that you should be forced to carry this financial weight and our Springfield cerebral palsy lawyers can help ease your burden by making sure that the hospital and staff responsible are required to provide compensation that you can use for your out of pocket expenses, lost time from work, medical care and pain and suffering. Hypoxia and jaundice are two conditions frequently linked to cerebral palsy and both can result from complications and injuries endured throughout a pregnancy or during birth. 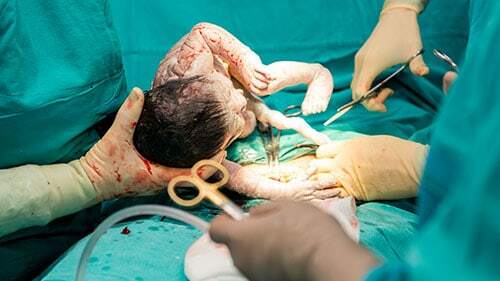 It is the duty of doctors to properly evaluate expectant mothers to assess the risk of complications and to identify issues that could present concerns during labor. These concerns can include the following. Fetal distress— there are a number of injuries or conditions that can send the child into distress and prompt the need for immediate action. This is why it is imperative that a nurse properly monitors the child’s vital signs during labor and delivery so that the doctor can know if and when there is a problem. The failure to quickly order an emergency C-section can be the greatest contributing factor in some cases leading to cerebral palsy. Jaundice— bumps and bruises are expected during delivery and in device assisted deliveries, children may endure treatable injuries due to the nature of the delivery. When caught and treated quickly, jaundice is practically harmless, but the failure to notice it can be catastrophic because of the liver’s inability to process bilirubin at such a young age. This can lead to brain damage. There is simply no excuse for this type of injury when considering that jaundice can be detected by merely looking at a newborn child. Infections before or following birth— infants do not have fully developed immune systems, making it easy for an infection to have severe consequences through invasion of critical organs such as the heart, lungs and brain. All of this can lead to a number of complications, brain damage included. Misinterpreted test results— it is very important that doctors make sure they are properly interpreting test results and that they communicate with the lab when a result does not make sense. The failure of doctors to interpret tests results can be the cause of a failed diagnosis or the selection of the wrong treatment plan. Undetected membrane ruptures— a ruptured membrane can quickly lead to oxygen deprivation, which is a large contributing factor to the development of cerebral palsy. The risk increases exponentially when the rupture has gone undetected for more than 24 hours. When proving medical malpractice, we must show that medical professionals did not act in the same manner their peers would have under the same circumstances. If you feel that your child’s injuries were due to negligence, we can review your medical records to assess how well the doctors and attending staff members handled your pregnancy, delivery and recovery period to determine whether they met their duty of care. Rosenfeld Injury Lawyers LLC is a leading advocate for those who care for children injured at birth and we can make sure that you do not need to provide for your special needs child without the support and resources that you need. We understand that your family suffers alongside your child and will do whatever it takes to provide you with the peace of mind that comes with knowing your child’s needs will be met for his or her entire lifetime. Contact us today to schedule a free case evaluation with one of our award winning Springfield cerebral palsy attorneys so that we can collect the information we need to conduct our investigation into your claim. After we review your medical records and seek the opinion of medical experts and economists, we can accurately determine the value of your case and pursue an appropriate level of compensation that will ensure all of your future expenses will be covered. If we are unable to secure damages on your behalf, you are assured that our services will come free of charge.